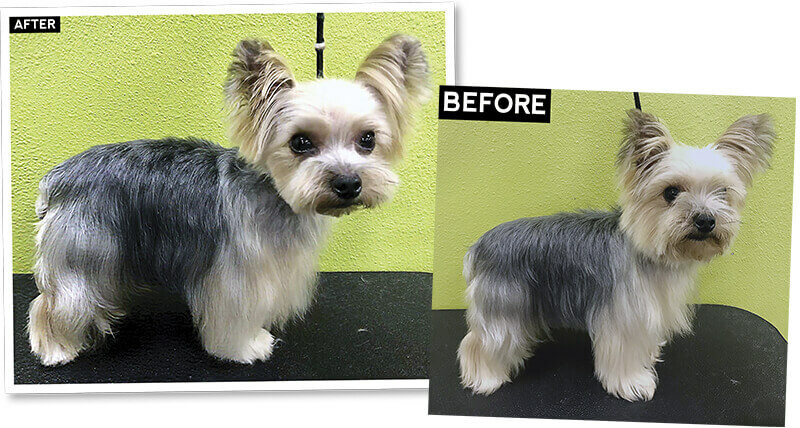 The Yorkshire Terrier is one of the most popular breeds that we see in the salon every day. We often experience difficulty in styling the Yorkie to suit the owner’s maintenance needs with giving them an eye-appealing trim. Doing a Westie trim on the body allows you to meet the needs of the client. I’ve also decided to do an Asian style on the head of this dog because the top of her head was already short. I have strictly used thinning shears and a clipper for this groom. Fig 1) Going with the grain, use a #1 snap on comb (or any that suits your dog) for creating the Westie pattern. Expose the hip muscle slightly. Fig 2) Make sure to clip the neck, starting just behind the occipital bone. Fig 3) Take your clipper work around to the front and clip down to the end of the shoulder muscle. Fig 4) Using the same snap on comb, carefully clip under the throat down to the breast bone. Fig 5) When trimming the feet, pick up each foot and trim right in front of the middle toes. Fig 6) With this dog, I have trimmed the hair using thinning shears around the shape of the tail. This is an area where you can ask the owner their preference and depending on desired length, choose from several finish options. Fig 7) Once you have the top of the tail trimmed, lift the tail up and carefully, using thinning shears or a #10 blade, take the hair off the base of the tail. Once that is done, at a 45 degree angle, trim above your point of rump to blend the body hair into the hair on the furnishings. Fig 8) Moving to the front feet, again trim only in front of the middle toes with the foot picked up. Fig 9) Stack your dog for balance and comb your coat and furnishings down, trimming the bottom at the owner’s desired length. 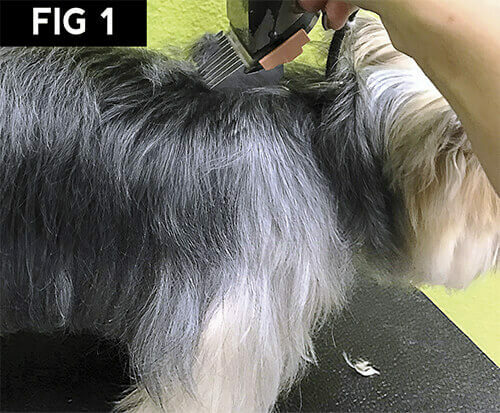 Fig 10) When your dog is stacked, finish the feet and trim the hair that falls off the back of the leg, making sure that it’s cut just above the ground. Fig 11) Using thinning shears, lightly blend your body hair into your skirt to remove any clipper lines or bulk. Fig 12) Repeat step 10 for the back feet. Fig 13) Carefully and lightly, trim the hair just under the eyes. You can also trim between the eyes to remove any of the bulk. Do not go down the bridge of the nose. I use thinning shears in this area. Fig 14) Using thinning shears, trim off your visor, the top of the head and back to the occipital bone in between the ears. This can be any shape that you prefer but the shorter that you go, the more pronounced your “Koala ears” will look. Fig 15) Trim off the chin, leaving roughly 1/4 of an inch. Trim off the lower corners of the muzzle at an angle, then shape your muzzle into an oval shape. Fig 16) Using thinning shears, trim off about 1/2 inch of the cheek between your muzzle and the vail of the ear hair. Go all the way up to the top of the skull that you have already trimmed. Fig 17) Determine how long your ear fans will be. You can leave them as long or short as you’d like. With this dog, I’ve tipped the shape in. Trim the tips of the ears to slightly expose the shape, using your fingers to guard the skin. Fig 18) Again, leaving the ears at your desired length, trim straight across just along the bottom of the fan. Create a half moon shape on the outer edge of the ear. Fig 19) Pull the ear forward and blend the back and remove the bulk. Lastly, present your dog to her owner and enjoy a happy client!